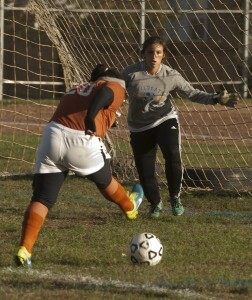 Goalkeeper Haley Womack and her Wolcott Tech teammates have enjoyed a memorable season. Jim Shannon – Waterbury Republican-American. Believe it or not, championship season has arrived. League championships and tournaments began already, and this weekend the CIAC championship events begin. With all that going on, there were still a plethora of wonderful features covering high school sports to share in this new edition of Linked Up, including stories on lots of different sports. From Litchfieldcountysports.com: The Derby boys soccer team earned a lot of fans with a classy gesture. From the Waterbury Republican-American: It has been a dream season for the Wolcott Tech girls soccer squad. From the Norwich Bulletin: Several teams are aiming to reclaim the ECC’s success at the CIAC cross country championships. From the Stamford Advocate: Westhill girls soccer is ready to try and bring its regular season success into the postseason. From the Hartford Courant: She was a star in several sports in high school, now Ellie Jean has a great opportunity for US soccer. From the New London Day: Norwich Tech girls volleyball has found the winning formula. From the Bristol Press: Kendall Davis has been a standout for the St. Paul girls soccer squad. From the Danbury News Times: Last year’s championship game is not on the minds of New Fairfield and Brookfield this weekend. From the Meriden Record Journal: Outstanding chemistry has helped Southington girls volleyball deal with big changes. From the Norwalk Hour: Amidst a season of change, Brien McMahon quarterback Chris Druin stays positive. From Shore Publishing: A positional shift has been a smooth change for Haddam-Killingworth volleyball’s Sam Mohammed. From the Hartford Courant: A great collaboration and partnership has given Capital Prep some home turf. From the Darien Times: The “Blue Wall” offensive line has played a big role in the Darien football team’s offensive prowess. From the Connecticut Post: Two Bridgeport football teams will have a new league home next year. From GameTimeCT: The beat goes on for Ansonia football which has reloaded again. From the New Haven Register: A former Cheshire football standout is being recognized for his selflessness. From TheRudenReport.com: It looks like a very balanced field in the upcoming FCIAC boys soccer tournament. From the Newtown Bee: Only tangentially related to athletics but a worthy tribute to folks who help make schools (and athletics programs) work.